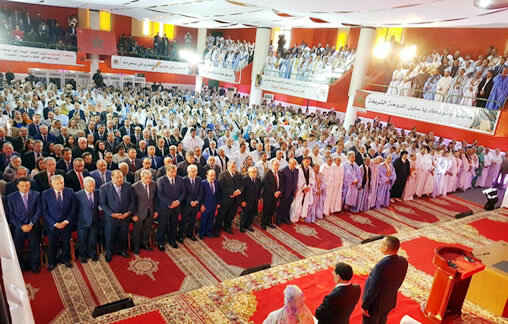 The meeting, held Monday in Laayoune, southern Morocco, by political parties and all components of Moroccan society, sends “a strong message” to the international community and enemies of Morocco’s territorial integrity, said Head of Government, Saad Eddine El Othmani. This meeting shows the constant mobilization of the Moroccan people and its unity to defend the country’s sovereignty, under the leadership of King Mohammed VI, he added. The Algeria-backed Polisario separatist front recently made repeated incursions in the buffer zone, east of Morocco’s security berm. Under the UN-brokered agreements of 1991, Morocco had handed this demilitarized area to the MINURSO, entrusted with monitoring the ceasefire. Lately, the separatist front revealed plans to transfer some of its military and civilian structures to the demilitarized zones and started mounting tents and deploying military equipment including in Tifariti, Bir Lahlou and Mahbes, in the buffer zone. The Laayoune gathering is the best response to the provocations and maneuvers of the Polisario front in the buffer zone, said El Othmani, renewing Morocco’s total rejection of the separatists’ desperate attempts to gain a foothold in that area. Morocco rejects the policy of fait accompli and is ready to counter any eventuality with firmness, said El Othmani who attended the Laayoune meeting as leader of the ruling PJD. The North African Kingdom rejects any attempt to alter the status quo in the buffer strip and will respond with firmness to the separatists’ provocative acts he said. 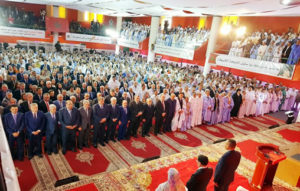 During the meeting in Laayoune, leaders of political parties, MPs, elected officials, Chioukhs, dignitaries and Sahrawi activists condemned the Polisario’s hostile acts and expressed their unity to foil all plots hatched against the country’s sovereignty. Participants of the Laayoune meeting signed a joint signed statement, dubbed Laayoune Declaration, urging the United Nations to act against the Polisario’s provocative actions that are threatening security and stability in the region. They called on MINURSO and the international community to take firm, resolute and deterrent measures to force the secessionists armed militia to withdraw from the buffer zone. They also reaffirmed Morocco’s attachment to the peaceful, political and lasting solution agreed upon under the auspices of the United Nations, making it clear that the UN is the sole framework to seek a solution that guarantees the protection of Morocco’s rights and the preservation of peace in the region. The Laayoune Declaration said the only option to end this artificial conflict lies in the autonomy plan under Moroccan sovereignty described by the international community as “serious and credible”. It urged the international community to act to put an end to the suffering of the sequestered people in the Tindouf camps and to exert pressure on Algeria and the Polisario to enable UNHCR to conduct a census according to international standards. Last week, King Mohammed VI addressed a written message to UN Secretary General Antonio Guterres, renewing Morocco’s rejection of the incursions of the Polisario in the Sahara buffer zone, describing these incursions as “provocative” and “unacceptable”. The King made it clear that such incursions by the Polisario represent a threat to the ceasefire agreement and violate international law and UN resolutions in addition to undermining the political process. King Mohammed VI also had a phone talk with the UN Chief and drew his attention to Algeria’s responsibility in perpetuating the Sahara conflict, which has dragged on for over four decades. “Algeria has a big responsibility as it funds, hosts, arms and backs the Polisario diplomatically,” the sovereign had recalled. In his annual report on the Sahara that he submitted last Wednesday (April 4) to the Security Council, the UN chief also hinted to the involvement of Algeria in the regional conflict through its funding, hosting and arming the Polisario separatist group. He has thus urged Algeria to “make important contributions to the political process” and to step up “its commitment to the negotiation process”. The UN chief said that in the era of global interdependence, “the socio-economic, humanitarian and security consequences of this protracted conflict weigh heavily on regional and sub-regional integration”. Written by: Jaber Ali on April 10, 2018. Posted by Jaber Ali on Apr 10 2018. Filed under Headlines, World News. You can follow any responses to this entry through the RSS 2.0. Both comments and pings are currently closed.